I can answer my own question. It fits the X100F, GFX50S with 110mm or 250mm (only measured that up so far), batteries, cleaning stuff, SD cards, and sundry small items. Not much spare room but everything fits snugly. Weight 6 kilos and case feel solid enough for purpose. Of course the batteries and other stuff could be carried in jacket pockets. 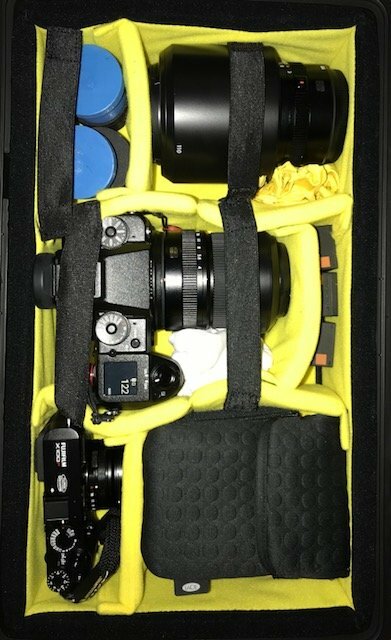 Then I could carry a Godox AD200 - but having the case with velcro dividers, one can adjust quickly and easily. My first Peli case. Thanks for the photo and description, Him. This new light(er) weight Air range looks very interesting. I have one of the earlier style Peli cases - the Peli 1450 - which is smaller than the Air 1485 but over 1kg heavier. It's a brilliant case, which I used to use when I went camping. I remember waking one night during heavy rain to find the Peli literally floating on a flooded campsite, but it remained completely dry inside. It's saved my gear on a few other occasions as well, and it's also great for carrying gear in the boot of the car on bumpy country roads. It IS heavy, though. It would be nice to have something equally strong but lighter, like the Air 1485. And it looks as though they've improved the divider set as well. So, as I say, thanks for the post. You might have lured me into spending more money! I dare not count how many bags I have owned! I am hoping this is the 'one' to end it all. I am hoping this is the 'one' to end it all. Ha ha! You reckon? Buying camera bags seems to be rather addictive. But at least the Peli should survive any forthcoming apocalypse. I intend buying the 250mm + 1.4 converter. Selling the 32-64mm. I hope the Peli last. Bag buyers(!) indeed it is a wee bit addictive. The one thing I have to still get used to is that the closing latches make such a noise! They seem really loud to me, make me wonder how long they will last! I don't know about the previous models but the Air models seem to be solid and the yellow padding and velcro is supplied in enough quantity to make up a myriad of positions. It won't hold a full GFX set, but I never travel with my whole set. I will take the GFX and 63mm + 100F to the London-Brighton Veteran car run in November. I am booked on one of the open-deck buses following the cars down. I may be able to get away with my Hadley Pro bag for that. The next trip after that to Bergen will definitely have the Peli in action.